STOP HS2 | Farage and Bennett boosted by HS2 poll ahead of debate. The leaders of both The Green Party and UKIP have responded positively to a poll conducted by Com Res, which vindicates their parties’ opposition to HS2. Only 22% of the public said they were in favour of the construction of the railway line when asked if they would support the projects at the current official cost of £50bn, the lowest level of support recorded since polling was first conducted in January 2012. 43% of the public put it as their last priority in a list of eight spending options. Just 1% of British adults told ComRes that high speed rail from London to Birmingham, Leeds and Manchester (HS2) is their top priority for government spending, the lowest of all options tested. 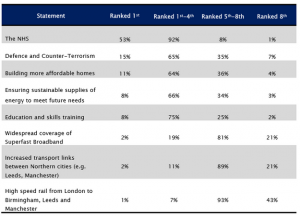 In addition, only 7% of British adults say that HS2 is one of their top four priorities for government spending. When asked if they would support HS2 if the costs increased, support for HS2 fell even further, with only 13% supporting it at a cost of £70bn, and just 7% at a cost of £100bn. I am a resident of Park Lane, Harefield against the HS2 railway. I am writing to enquire about major construction work now going on just inside the M25 near Denham airdrome and West Hyde. This work seems to be right in line with the proposed HS2 route! Do we need to be worried or has this nothing to do with the railway? Small world!……I too am a resident on Park Lane Harefield……The construction works, to which you refer (realignment of Tile House Lane culminating in a ‘y’ split junction to the A 412, with a parallel, new track/road) are indeed in direct accord with that depicted in the ES for the West Hyde Chiltern tunnel portal and cutting works……. However, also mentioned in the ES is reference to simultaneous works, already with approval for ‘mineral extraction’ at Denham Park Farm, for which these activities could be……..how convenient though do you not think?